In today’s busy world, more and more jobs are being performed on the go. It’s true people still work from home on a daily basis. However, a trend seems to see more people out working while experiencing new places. All while maintaining productivity. This trend applies when you are traveling for work or just want to get some things accomplished at a local coffee shop. If you are one of few finding themselves needing to carry a “home office” aka mobile office around more often than not, there are many items today that can help you stay organized while maintaining productivity. There are many benefits to working with a tablet. The compact size makes travel a breeze. It also makes damage from being dropped more likely. Not that dropping a laptop will not damage it. It is the fact that chances are you are more likely to drop a tablet. Tablets fully charged as we all know can last hours longer than a laptop in most cases. Also, external power banks can double and even triple a tablets charge on the go. However, while tablets offer high definition audio and video, the viewscreen is considerably smaller. This makes work harder on complex documents or images. Adding a Bluetooth keyboard will assist with some of these challenges. The touchscreen interface of a tablet can make some jobs quick and easy. However, for other tasks like lots of typing, accessories are needed. You do not want to type an entire document from scratch on a touchscreen. Having the added keyboard saves a great deal of time and frustration. With cloud storage and file sharing services like Dropbox or Google Drive, your files are available for work or sharing. Of course, you need Wi-Fi access but how can you work without internet access these days? You can always work locally and upload at a later date. This, however, limits a tablets true ability to be portable. Files can be stored on a tablet. The storage capacity is very limited and fixed to a much smaller amount than a laptop. Apps exist for tablets that offer some of the same features of common software programs. The options are limited but apps are coming a long way and now competing with the full installs found on computers. When you think of a tablet, you might think less expensive. While there are lower priced tablets with a cost far less than that of a laptop, higher-end tablets will start to cost as much as a mid-range laptop and yet offer far less in the way of usability for the same price. Definitely, something to consider if you decide on the dual route. Most people are used to working with a laptop both at home and at work. Newer laptops are lightweight and offer screen sizes up to 17 inches with a variety of resolution choices. This allows for a larger visual workspace and higher definition on demand. A laptop has battery power and is easy to power using any wall outlet, or an adapter for charging in a car. A laptop vs a tablet can easily tap into unlimited storage capability. Not only will a laptop start with an exponentially larger hard drive, it also easily extends its storage using external backup/storage units that easily connect to a USB port. Huge storage options now commonly available and very affordable. Most external storage units include software that can automatically back up all your files. This is nice in case there is a problem with your laptop. Backing up your files is always a great idea. Let’s clear up the storage question with tablets. Yes, this small rant should be moved to the above section about tablets but needs to be addressed. While yes, it is possible to use a back up hard drive with a tablet, the current options right now are limited. This can change tomorrow, it is technology, right? The issues on tablets are mainly power through USB. Tablets save power and are designed to use less. External USB drives need power or they do not function. Also, the conversion cables to get a USB device to work with whatever port you are trying to match. Have you been to a friends house and asked to borrow a charger recently? Once you figure out this port situation, now does the tablet/phone support this newly plugged in USB device or does it need an app and which one? Opportunity for improvement here. Back to the workhorse. Laptops have a built-in keyboard, mouse, and can easily use USB accessories for specialized tasks. In addition, USB hubs can easily expand the number of available ports, no special conversion cables here. This allows all USB accessories to be available at once. Bluetooth devices are easily added and a simple adapter allows older laptops to become Bluetooth compatible. For software availability, the laptop has the capability to install and run any full program suite you need for your workday. For in-depth work such as illustration, digital photography, or video editing, a laptop is still the right choice at this time. Options are coming along quickly and I’m excited to see the progress. High-end laptops are much more expensive than a tablet, however most low to mid-range laptops are more than enough to accomplish most workplace tasks. Though a laptop may be bit bigger, it is less prone to dropping, has a larger screen, storage, and accessories available that are much more difficult to get working with a tablet. More recently, the newer hybrid tablet/laptop models have been successfully performing as both a laptop and a tablet. While there is still room for improvement, I believe the industry is on the right track. Many products are available today and are designed to help you. They easily transport what you need for a productive and organized workday. All, while staying organized and looking professional in the process! When you travel a lot or just want to get more work done on the go, one of the things you can’t do without is a good bag or backpack. This is a must to organize and transport your mobile office. This is your primary home for laptops, tablets and any other accessories and supplies needed during the day. The Volher 17 Inch Laptop Bag is one example. Made with protective shockproof padding and can hold laptops up to 17 inches. For organizing, there are more than ten compartments available to keep office supplies tidy with room for other items such as a water bottle and umbrella. 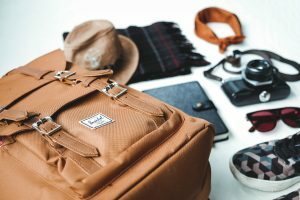 These types of bags have an extra feature that enables it to unzip and expand an extra two inches, from seven to nine inches wide, allowing for packing really bulky items like a few books or an extra set of clothes (for that overnight business trip). This example even has a luggage belt so that you can securely attach the bag to your rolling luggage for that running dash through the airport. 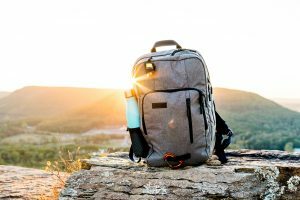 If you enjoy hiking, working outdoors, or just visiting the local coffee shop, the SwissGear Travel Gear 1900 Scansmart Laptop Backpack can take your office as far out as you like. The softly lined sleeve can accommodate laptops up to 17 inches and there are many pockets for organization of everything from office supplies to an extra set of clothes. There is more than enough room for those USB backups, cameras, and extra battery packs to keep you up and running for days. The backpack is made from a lightweight water-resistant nylon and provides protection from the weather. The water bottle holder on the side is a must for any portable office solution to keep hydrated on the go. If you want powerful charging solutions on the go, there are options on bags that have built-in power banks. They have designated compartments for things like laptops, keyboards, and tablets. They are supposed to be checkpoint-friendly for airport security. Not too sure about this option as in the near future back up batteries may no longer be allowed on an airplane. Many items and accessories can fit in pockets and compartments of a laptop bag or backpack. However, you will find very quickly that having a designated organizer will help keep all the various cords, chargers and other accessories from ending up in a jumbled knot. You know, the knot that ends up at the bottom of the bag and comes out grabbing every extra item it can on the way out. Roll up and folding travel organizer cases give a nice variety of pockets and elastic bands to secure all your technological gadgets and doohickeys. These cases fold open like a large book and then roll or fold up to a nice tidy size. When closed, they are conveniently-sized to tuck in a briefcase, bag or purse. The compartments and zippered pockets offered are sized to hold anything from smartphones, power banks, to SD cards. Check to make sure the outside fabric is a durable and water-resistant. These are available in different sizes and colors. This is very helpful when you use more than one, you can tell at a glance which one to take. For easy organization of specific devices and their accessories, cases are made designed around a product. For example, Go Pro has hundreds if not thousands of case options. They are specifically designed to help keep all of its accessories organized. 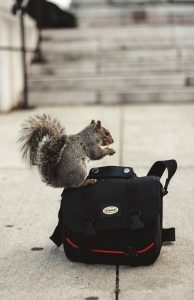 There are these same types of specialty bags for cameras, go-pros, drones, charging stations, even designated computer accessories like a mouse and keyboard. One area to think about is large organizers. At first, they are great at getting all of your accessories organized. This is until you only need a specific set of items. Do you really want to bring all of the Go Pro accessories? Really when all you need is a backup battery, cables, tablet, and the small Bluetooth keyboard? This is when having multiple small possibly color coded organizers really shine. Having more than one organizer, allows you to store items for different devices separately. This doubles in convenience allowing you to grab a few items for specific devices instead of having to bring along the whole bag. An incredibly simple and useful item for your mobile car office is a front seat organizer. This organizer hangs on the front of the passenger seat for example. This allows the driver to have easy access to pockets and compartments big enough to store tablets, water bottles, smartphones, notebooks, office supplies, sunglasses and more. Organizing with the vertical storage doesn’t only have to be for the home. This allows much easier access to find something quickly. Conveniently this will prevent having large random objects from “the pile on the seat” hitting the floor the first time the brakes are hit. If you need to use the passenger seat for a person, simply swing the organizer around to the back of the seat to make space. This clever organizer actually prevents that embarrassing few minutes you have to spend throwing things over your shoulder into the backseat while someone stands in the doorway waiting to sit down. A great idea from the category of “I wish I’d thought of this!” is the Hanger Headrest Hooks—a simple and ingenious way to secure large or heavy items during travel. These are perfect for hanging grocery bags so that you don’t have to put them on the seat or the floor and have everything spill out and roll around on the floorboards while you are driving home. These hooks are sturdy enough for heavy grocery bags. Also, they are perfect for hanging a heavy laptop bag or backpack. This keeping them up off the floor and seats and putting everything within easy reach when you need them. While working out of your car, do you find yourself limited to only one or two lighter sockets for powering all your technology? A great solution to this problem is a Power Inverter. Using only one lighter socket, an inverter offers AC outlets and some with extra fast charging USB ports. This gives the option to charge and/or power all the gadgets at the same time! With safety in mind, make sure the inverter you select has a built-in fuse and overvoltage/low voltage/overload/short circuit and overheating protection to keep your devices and car safe. 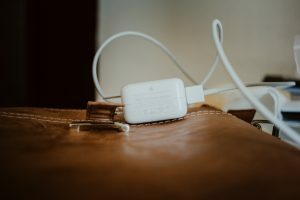 Speaking of power, if you carry a Portable Power Bank, you can pretty much guarantee that you can keep any laptop and other devices charged for hours while away from home. Most now come with smart charging technology which safely delivers the right amount of power to each device to easily and safely keep all your devices charged. For longer trips, (or post-apocalyptic use) the ultimate in powering your devices would be a charger like the Voltaic Systems Arc 20 Watt Rapid Solar Laptop Charger. Small but high-performance solar panels will store energy even on a cloudy day. Attach the panels to your backpack, bicycle or other equipment to collect energy while you travel. The included power bank is designed to power and charge many laptop computers, DSLR batteries, USB devices, including tablets and smartphones. Six hours of sunlight fully charges most laptops and most smartphones charge in just one hour. No matter what else has happened in the world, you will still be able to play Angry Birds on your smartphone. What if you reach your desired work site and there is no desk for you to use? Something like this handy Tabletote Plus Portable Computer Stand gives you the option to set up your own workspace wherever you go. With a weight less than three pounds, you can stash this table in a backpack or bag, and use it wherever you find yourself in need of room to work. In seconds you can unfold and set up your workspace, with legs easily extending from 12 inches to 29 inches, while the workspace surface expands from 13 inches to 22 inches. Add the included cup holder, document holder, and a phone/tablet holder and you are ready to work! If you need to work in your car, there are options for fold-able tables. The table converts your front seat into a desk space for your laptop and mouse. Some options unfold and hang on the steering wheel, and you have a height-adjustable workspace. I’ve just never found an easy way to work with a laptop from the driver seat of a car. I guess the laptop in the lap will have to do for now. If you like to stay indoors and curl up in your favorite book store’s comfy chairs, work comfortably with a portable laptop stand. With fold out legs to adjust height and angle you can get comfortable in any position. Features include a built-in stop bar, cooling fans, and a mouse platform. You can read a full review located here. When using a portable table, or just need a place to sit on occasion, there are many options for portable seating. One crazy looking option that provides lightweight portable seating is the Sitgo Portable Seat. This thing unfolds from the size of a large water bottle. Then turn into an adjustable leaning stool that provides a place to sit whenever and wherever you need one. Designed for outdoor use, these are just as handy at the amusement park as they are at a sporting event. Use this as an option for a standing workstation as well. If you want a little more support for your behind, a folding stool might be a good solution. The Geertop Large Folding Stool provides a larger seat than most folding stools and can support up to 440 pounds. These types of stools still give you the portable convenience with built-in carry straps. For comfort when seated for longer periods, check out high-end camping chairs. They come in every shape size and color. These are specially designed for comfort and strength. With larger seats capable of supporting up to 350 pounds. These types of chairs fold up quickly and is easy to transport in included carry bags. If you prefer a firmer seat than a camping or pop up chair provides, a good choice is the ridged portable aluminum director’s folding chairs. They have padded seats and armrests to provide comfort that can support up to 300 pounds. These chairs come with folding side tables, drink holders and enough space for other small items. They all fold down when not in use. These products also have carry bags specifically designed for transport. If you will be working outdoors and want to have some protection from the sun, get a sports umbrella. They attach and work with any portable chair. (even bleachers) These umbrellas options provide UPF protection of 50+ to protect you from 99% of the sun’s rays. Find ones that attach a clamp to the back of your chair and adjust the umbrella to your liking. Whether your car is your office or you have a portable chair. Proper ergonomics is just as important as it is in a traditional office. You already realize when spending a lot of time driving and how your back can hurt from sitting in one position for so long. Find a product with good ergonomic back support. This is an overlooked item and will sometimes be in the way. However, with a backrest, your improved posture not only helps to prevent a lot of the pain from sitting for long periods, it can also help you stay more focused. What if you need a quick stop for a meal or coffee? Do you have a few minutes to catch up on texts or email? Can you do this without hauling out the whole laptop kit and caboodle? Wait, is that free Wi-Fi? No matter the situation Just pull up a seat. Doesn’t matter if you are in a favorite fast food franchise or coffee shop. Set your device on a stand for hands-free use. A laptop stand can adjust to any height or angle but what about phones and tablets? There are a few DYI options which are super easy. These are super cheap products that are easily found and will fit any needs. Some tablet and phone cases come with built-in stands which take care of this task for you.Having a stand is very handy for everything from a video conference call to watching your phone for texts while you work. Get one if not already attached that quickly folds flat and slips back into your bag when it’s time to go. The wide variety of wireless accessories for laptops, tablets, and phones make it so easy to customize devices for your needs. Selecting Bluetooth-enabled accessories allows the ability to share between laptop and tablet devices. If you love your laptop but hate the touchpad, a wireless mouse is your best friend and a comfortable solution. With a simple nano receiver “dongle”, you can have the comfort and ease of a wireless mouse. A wireless mouse is plug and play compatible with any Notebook, PC, Laptop or MacBook that has a USB port. When not in use the receiver stores inside the mouse. These mouse options are small enough to fit in most device organizers or the pocket of a laptop bag. When you prefer to have your laptop on a stand for neck and shoulder comfort, this, in turn, puts the keyboard at an uncomfortable angle for typing. There are many options for a wireless keyboard and mouse combos. Most of the combo options only need one USB port to control both devices. One thing you might miss when moving to a tablet or a smaller more portable laptop is the number pad. This is a big deciding factor when choosing which laptop to buy. When you work a lot with product numbers, spreadsheets or accounting, you may enjoy the convenience of a wireless number keypad. There are many options just like the keyboard and mouse. Just remember if you are you are entering data with your tablet or smartphone, you might prefer a Bluetooth model. Some models even offer shortcuts for smartphones and tablets. If you enjoy listening to music while working and need hands-free ability to answer phone calls while working you defiantly want Bluetooth headphones. They come in every style for over ear or in ear for maximum comfort. A lot of reviews and people will tell you that all Bluetooth devices are pretty equal. I will tell you they are NOT. I’ve had plugins, over the ear, and twist and lock earphones and each has their unique qualities. As far as performance, I’ve never had a better sounding or performing headphones that work with a phone than the Bluetooth Bose Sports Headphones. They were an amazing gift. If I lost or broke them right now, I can without a doubt tell you I would buy a new pair tomorrow without a second thought. These tiny, wireless, earbud-style “headphones” fit right into your ear canal and provide excellent sound quality for music and speech. The built-in microphones allow you to take or make hands-free phone calls. The earbuds are designed for use while exercising. Like most earphones, they come with different silicone caps to customize for your ear shape. They are comfortable and stay in place while you work (or work out). The storage case I lost long ago but really only fit the earphones and not much to write about. And of course, if you are using multiple USB accessories, you want to purchase a USB hub like Anker is a good brand. USB hubs turn a single USB port into four and are very helpful when using all of your USB gadgets at the same time. You now know how to get organized on the go. You will get more work done during the day, with less stress, and impress coworkers and clients with your style. Grab your bag, throw in your mobile organizers, don’t forget the mobile accessories and you are ready to move your mobile office from site to site. Pack in a few convenience items depending on the destination. Your now well on the way to putting in a full days work whether you sitting in a coffee shop or hanging in a hammock on your sailboat.